And now for something completely adorable and usable! 12 Legs is excited to present our Original Concept and Design Candy Shoppe Cupcake Jar Classic Swirl Collection (embellishments not included). 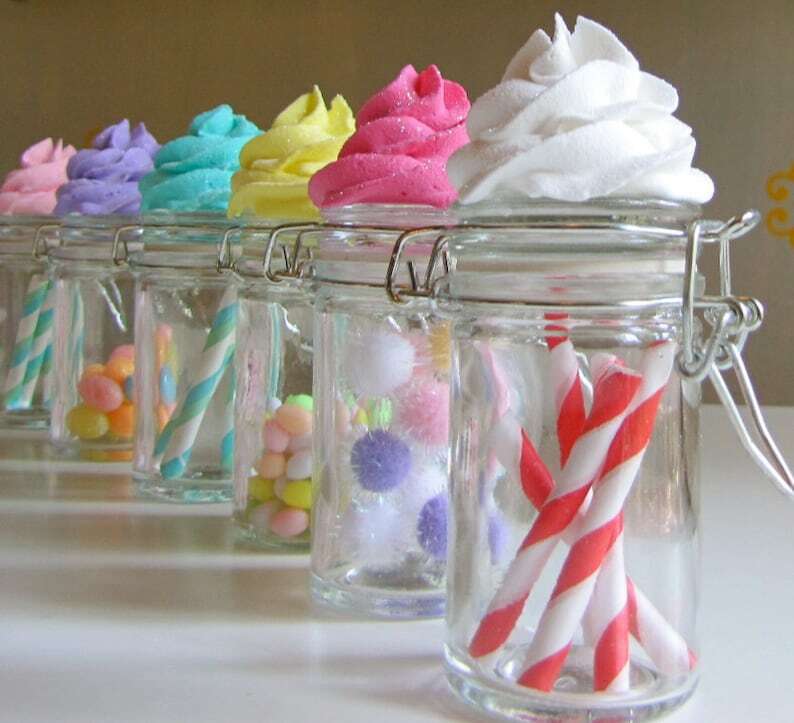 These adorable jars make unique Wedding Favors (simply add the bride/grooms favorite candy), Birthday Favor Containers, Embellishment Jars for Artisans to stay organized or just to brighten up any space. The inside of these glass jars are approx. 3 1/4" h with a base of 1 1/2" w. With the icing, they are approx. 5 1/2" h from the base of the jar to the top of the icing. You will receive the set of 6 pictured. If you would like a custom listing, please convo us and we can put together a custom listing of colors and quantity. Our faux cupcakes are made 100% by hand in our 12 Legs "Fake Bake" Kitchen, with our secret inedible recipe and are truly a labor of love process. FRIENDLY FYI FOR 12 LEGS CUSTOMERS: THESE CUPCAKES ARE MADE TO ORDER AND MAY VARY SLIGHTLY FROM CUPCAKES PICTURED. CUPCAKES WILL BE VERY CLOSE, BUT NOT EXACT. Since cupcakes are made to order, they will be shipped 2 to 3 business days of being ordered and will be shipped USPS First Class. Please note that this IS NOT A TOY, SHOULD NOT BE PLACED NEAR FLAMES OR WATER AND IS DEFINITELY NOT EDIBLE. Contact Information: All questions regarding merchandise, shipping information, order requests, should be sent prior to bidding. We will respond to your questions and order requests within 24 hours or sooner. Forms of Payments and Shipping Info... We accept payments via paypal.com. Our shipping charges will be based on shipping via USPS First Class. We also purchase a delivery confirmation so you can track your orders. A flat fee of $11.50 will be charged for shipping/handling for the 48 states located within the U.S. Additional shipping will be required for Hawaii and Alaska. At this time we are only offering shipping for a few international countries. Please verify that we ship to your country prior to bidding and in order to get shipping costs internationally since all shipping costs will vary based on country. If you would like to have your item shipped via another method, please contact 12 legs. Policies and Returns... We guarantee 100% satisfaction for all of our merchandise. If you are not completely satisfied with your purchase, return within 3 days for a full refund for merchandise. Unfortunately, merchandise must be returned at buyer’s expense. Seller is not responsible for replacing lost or stolen merchandise. Lost or stolen merchandise must be filed via the insurance purchased by buyer, however, we will help in any way we can. ALL SALES ARE FINAL ON CUSTOM ORDERS. All information and items listed and described are considered property or 12 Legs Curiosities and Cards. All right reserved. 12 Legs Curiosities 2011. Birthday Favor or Baby Shower Favor Jar "Lime Green, Hot Pink & Pink" Collection Set 6 Orig. 12 Legs Concept Fab Birthday Favor/Decor Idea"
Easter "Pop Up" Sale. Receive 15% off your total order. Select Items only. No minimum purchase required. Does not apply to custom orders & some listings. Limited time only. One discount applied per order. Please confirm need by​​ dates prior to purchasing. Orders placed on or after April 18th will ship the end of the week of April 22nd. Ready to ship items (will have ready to ship in the listing title) if purchased individually will ship through the week of April 15th. Adorable jars! As always, 12Legs makes my day with their beautiful little faux frosted treasures! I got these as party favors for a six year olds party and she will freak when she sees these, the only problem is I'm afraid all the kids will try to eat them they look so real! :) . Thank you! We accept payments via Paypal.com and Etsy Direct Checkout. We welcome your feedback and take all feedback very seriously. The idea of getting less than 5 Star feedback breaks our hearts and makes us want to vomit. We want all of our customers to be happy. Should you receive your item and not be 100% satisfied, we offer a full money back guarantee less shipping charges (item to be returned at buyer's expense within 3 business days to gain full refund less shipping. Buyer must also purchase delivery confirmation for returned item). ALL CUSTOM ORDERS and INTERNATIONAL ORDERS ARE A SALES FINAL SCENARIO. Fake Cupcakes, Cupcake Lights, Faux Cakes & Swell Curiosities Perfect for Photo Props, Holiday Gift Giving or Keeping All for Yourself! Welcome One and All to 12 Legs Curiosities! ♡♡ All MADE TO ORDER ITEMS purchased on/after April 15th will ship the end of the week of April 22nd. Please note: My Listing's "in stock" section does not mean this is the amount that is ready to ship...this lets you know how many are available to be made and purchased at the time. If you need an order before then or by a specific date, please contact me prior to purchasing so we can discuss your need by date and delivery options. READY TO SHIP ITEMS WILL SHIP through the week of April 15th. Ready to ship items have Ready To Ship listed in the listing title. PLEASE NOTE: At this time, we are not shipping orders internationally♡♡♡. PLEASE NOTE: Larger "made to order" orders or detailed items may take longer than outlined above. When my goodies make a long journey especially in the hot days of spring and summer, there is a chance they may become a little soft in shipment, however, they firm up once placed in a controlled temperature environment. Once you receive them, please unwrap immediately. Store unwrapped and in a cool space. Our USPS shipping charges are based on shipping Priority Mail, which is 2 to 3 Days for regular size US orders (this ship time may vary based on inclement weather or general delays out of our control based on the USPS Delivery System). Larger orders maybe shipped Parcel Post based on weight and size of package. Please verify deadlines with us in order for your order to be shipped in time. WE ALSO ARE HAPPY TO SHIP MULTIPLE ORDERS TOGETHER FOR A SMALL ADDITIONAL FEE PER ITEM AS INDICATED IN OUR LISTINGS. Fake Cupcakes, Cupcake Lights, Faux Cakes & Swell Curiosities Perfect for Photo Props, Holiday Gift Giving or Keeping All for Yourself! Fake Cupcakes, Cupcake Lights, Faux Cakes & Swell Curiosities Perfect for Photo Props, Holiday Gift Giving or Keeping All for Yourself! Fake Cupcakes, Cupcake Lights, Faux Cakes & Swell Curiosities Perfect for Photo Props, Holiday Gift Giving or Keeping All for Yourself! Welcome One and All to 12 Legs Curiosities! Fake Cupcakes, Cupcake Lights, Faux Cakes & Swell Curiosities Perfect for Photo Props, Holiday Gift Giving or Keeping All for Yourself! Welcome One and All to 12 Legs Curiosities! If your order value is over $50, please indicate whether or not you would like to insure your item at time of purchase and this cost will be included (we recommend all orders are insured should item be damaged, lost or stolen in route) in your invoice. Unfortunately, we are unable to replace items that have been lost or stolen in the mail, however, here at 12 Legs we do not have hard-hardened hearts and will help you out as much as we can. Please Note: At this time we are not shipping internationally. For smaller US orders (DISH TOWEL ORDERS ARE SHIPPED VIA USPS FIRST CLASS), we usually ship USPS Priority Mail in order for you to receive your order faster and in order to provide you with a confirmation email to track your package. There is no extra charge for smaller orders to be shipped via Priority...it is included in our shipping cost. For larger, heavier orders, we may need to ship these items Parcel Post in order to minimize shipping costs to you the buyer. PLEASE NOTE: USPS RATES HAVE CHANGED FOR 2013. PLEASE VERIFY INTERNATIONAL SHIPPING RATES BEFORE ORDERING AND IF WE SHIP TO YOUR COUNTRY AS THE RATE LISTED IN MY SHOPPE MAY BE APART OF THE OLD PRICING AND AN INCREASE IN PRICING MAY BE DUE. IF SHIPPING COSTS ARE NOT VERIFIED, YOUR ORDER MAYBE SUBJECT TO CANCELLATION. FOR APPROVED INTERNATIONAL ORDERS, UNLESS SPECIFIED, WE SHIP USPS FIRST CLASS, WHICH DOES NOT ISSUE A TRACKING NUMBER. SINCE INTERNATIONAL SHIPPING TIMES VARY DUE TO USPS AND CUSTOMS, WE CANNOT BE HELD RESPONSIBLE FOR ANY DELAYED INTERNATIONAL SHIPMENTS, LOST MERCHANDISE, OR DAMAGED MERCHANDISE NOR GUARANTEE AN INTERNATIONAL SHIPPING DATE. ANY ADDITIONAL TAXES/CUSTOMS FEES INCURRED BY INTERNATIONAL SHIPPING WILL BE THE RESPONSIBILITY OF THE BUYER. PLEASE NOTE: ONLY TO THOSE NOT ON THE US BUREAU OF INDUSTRY AND SECURITY "DENIED PERSONS LIST." WE CURRENTLY DO NOT SHIP TO THE FOLLOWING COUNTRIES (OTHERS COUNTRIES MAY BE INCLUDED BUT NOT LISTED): CUBA, IRAN, SUDAN, SYRIA, NORTH KOREA. As stated in our listings, our cupcakes are NOT a toy and are inedible (NOT MADE FOR CONSUMPTION) and maybe harmful if ingested. Please exercise responsibility with our products. Please read our shoppe announcement regarding any updates as it relates to our baking schedules and ship times. If you need any item by a deadline, please contact us first to make sure we can accommodate your deadline. Also, please check your Etsy email frequently. If we have any questions or need to get in contact with you, you will be contacted via this email. We cannot be responsible for you not receiving our emails via your Etsy account. Also, make sure all of your shipping info is correct and up to date on both Etsy and Paypal. Your merchandise will be shipped to this address for security issues. 12 Legs cannot be held responsible for merchandise shipped to the wrong address due to addresses not being up to date on both of these sites, even with buyer contacting us with new address via Etsy convo. Please note that 12 Legs reserves the right to cancel any order at any time based on 0 to low feedback or suspicious transactions as deemed as such by 12 Legs. For security reasons for both our guests and 12 Legs, we will only email you via your Etsy convos. Please check your Etsy convos for updates and important messages. 12 Legs reserves the right to cancel any order at any time based on 0 to low feedback or any suspicious transactions deemed as so by 12 Legs Curiosities. During shipment, you may lose a few sprinkles from your cupcakes as with any real cupcake. This is normal (We make sure each cupcake has a generous amount for this very reason). We do, however, recommend buyers to purchase insurance in case of any serious damage caused by the post office during shipment. We pack our cupcakes extremely well to Post Office Standards and beyond, however, we cannot guarantee how they are handled after they leave our bakery. :) Per our policy, seller reserves the right for canceling orders based on buyer's little to no feedback at seller's discretion. Thank you!